For the sake of this post, I’m less interested in what to compost (That’s what Google is for) and more in the politics of the whole thing. 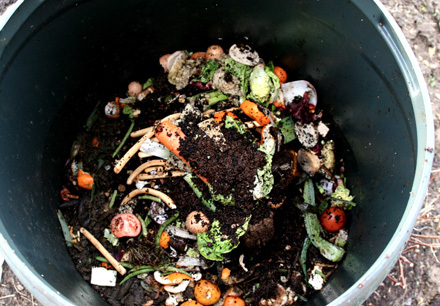 Composting is yet another activity in the growing list of things my grandparents did that are suddenly trendy. Until about a year ago, I associated composting with my avid gardening grandfather. Now, I associate it with Brooklyn and the occasional CouchSurfer that we host in our basement (who are all into biking and composting). It’s one more thing to feel guilty about no doing (like not buying organic and driving to work when I live next to a Metro stop). Fortunately, unlike the aforementioned activities, this one won’t cost *anything*. It’s not that we are doing only for fun or prestige what our grandparents did out of necessity. My grandparents didn’t have to knit, garden, compost, sew, or cook elaborate ethnic-y dishes from scratch because they had too. We are talking about 1960, not 1760. The world had invented stores. They were hobbyists who enjoyed doing these things on the weekend, just like the yuppie hipster set today. Of course, 50 years ago, sewing your clothes, growing your own veggies or crocheing your own blankets was a way to save money. These were also the hobbies available to women in an age before blogging, intermural kickball teams and happy hour. Now, these homemaker hobbies are more about a return to a quainter, non-manufactured time. It’s act of homespun rebellion. But of course, you can’t be a composting, cooking gardener rebel for so long (Take that Safeway! I won’t buy into your processed foods, Giant!) If you don’t enjoy it, you will quickly hang up your frying pan and hit the bar. Ultimately, I cook for the same reason that my grandmother did. I enjoy it. Oh yeah, and I’m cheap. I don’t know too many people that compost. There’s not a ton of space to get that done in Brooklyn. If it happens it’s on a pretty small scale, much like gardening for most people. I tend to associate it more with San Francisco, which actually separates collected trash into garbage, recyclables and compostables. I know a lot of people who compost, actually. We have our small indoor worm bin, and then take the rest to drop off at our community garden compost bin or at the Grand Army Plaza greenmarket’s compost drop-off. If you keep your scraps in the freezer, you don’t even have to deal with the smell!